Managing VMware with PowerShell book: Sample scripts now available. 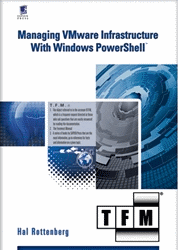 VMware vExpert Hal Rottenberg has been working hard on the definitive book for managing VMware with PowerShell. His publisher has posted about 40 sample scripts from the book available for download now. A quick glance through the scripts shows there’s a lot of stuff there related to configuring ESX hosts. Hal’s book should be out very soon but this is a great way to keep busy until then. This entry was posted in Uncategorized on April 23, 2009 by Carter Shanklin. this stuff is rubbish. Those code samples are garbage and don’t work. they are not even vsphere compatible. The scripts will work fine with any version of VI starting with 3.x, up to and including the latest vSphere. Of course, without reading the book and in particular, the paragraphs of text which surround each of these scripts in the book, you are missing the context and documentation which I provided for them. The samples are only meant to be a taste of what is in the book. They do not stand on their own. If you would like to see more, then visit http://vmware.com/go/powercli and have a look around the community. Aside from my book, there are a ton of resources available online. Lastly, if you ask in email (hal AT halr9000.com), I’ll send you a full chapter so that you can see if the book is something you would be interested in purchasing. Sherlcok on PowerCLI 4.0 U1 is out! www.mcafee.com/activate on PowerCLI 4.0 U1 is out! mcafee activate on PowerCLI 4.0 U1 is out!